JSC Rosoboronexport (part of the Rostec State Corporation) and JSC NPO High Precision Systems will arrange the first demonstration within a foreign defence show of the Pantsir-ME shipborne air-defence missile and artillery system developed and produced by the Instrument Design Bureau JSC KBP named after Academician A.Shipunov. The presentations of the Pantsir-ME air-defence missile and artillery system will be held at the IDEX 2019 exhibition on February 18-19, 2019. There will be a full-scale specimen to be demonstrated in the middle of the combined Russian exposition organized by Rosoboronexport, i.e. at the exhibit of the High Precision Systems (09-C20). “The current trends in the development of the navies force the maritime powers to equip their ships with reliable assets to counteract air threats, i.e. cruise missiles, unmanned aerial systems, helicopters and planes. A sophisticated system of countering practically all the possible aerial kill assets has been developed in Russia, and it will be represented at one of the largest world defence exhibitions in Abu Dhabi. Pantsir-ME can be installed on most Russian warships and is very well fit for ships manufactured by other countries. I am confident that it has very good export prospects in the Arab countries, South-East Asia and Latin America,” said Rosoboronexport’s Director General Alexander Mikheev. The Pantsir-ME air-defence missile and artillery system can be set up on ships with water displacement of more than 300 tons. The system provides a reliable protection of vessels from all the existing and prospective air assault weapons in the whole spectrum of their combat capabilities with an unconditional probability of kill, which is practically equivalent to one, including low-flying anti-ship missiles and unmanned aerial vehicles. The high effectiveness of intercepting anti-ship missiles is explained by high performance tactical and technical characteristics of the Pantsir-ME air-defence missile and artillery system. 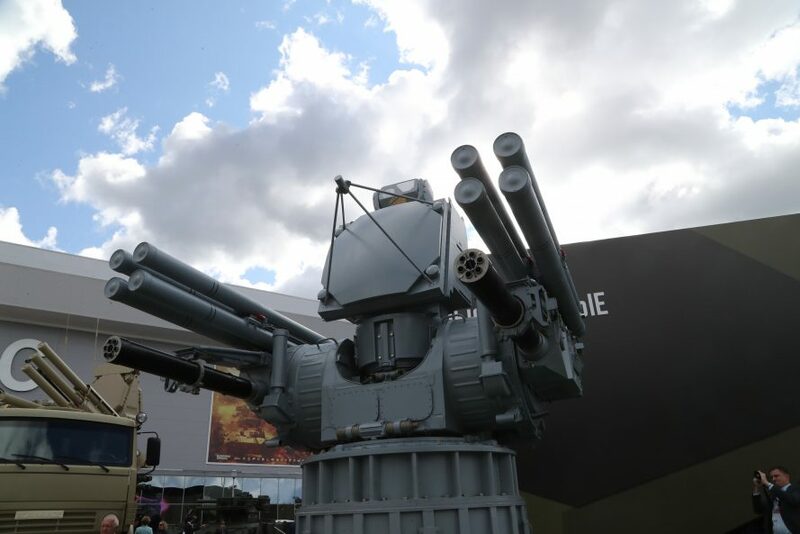 The system is capable of simultaneous firing at four targets attacking the ship while the kill zone for guided anti-aircraft missiles reaches 20 kilometers in distance and up to 15 kilometers in height. Besides, Pantsir-ME can first utilize its missile weapons, and then, in case of a miss, the target will be hit by the artillery fire with a 100 percent guarantee. The system includes a high-intelligent multimode adaptive radio-optical control system. All the stages of operator work – from the target acquisition to the firing – are completely automated. A combined use of the radio and optical control system provides for the all-weather and round-the-clock operability of the system. All this permits a guaranteed elimination of targets at long distances and in close proximity.